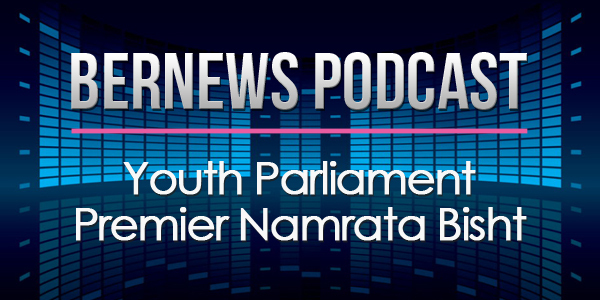 In the latest Bernews podcast, we talk to Namrata Bisht who may not yet be a household name – but she is a Premier and as such she has some forthright views. Ms Bisht, a BHS student who also went to CedarBridge, is the Premier of Bermuda’s Youth Parliament which meets weekly throughout the school terms. She is trying to bring a more international perspective to debates, such as the on-going war in Syria, whilst at the same time encouraging a more community-based approach. And if she were Premier for real? She said she would also bring more awareness about the disparity in wages in Bermuda. Bernews’ podcasts aim to provide an in-depth look at current affairs, and the text extracts above represent only a small portion of the full interview. You can also download the episode in MP3 format here, view past podcasts here, and subscribe via iTunes or to our app to download all our podcasts directly to your phone or tablet.